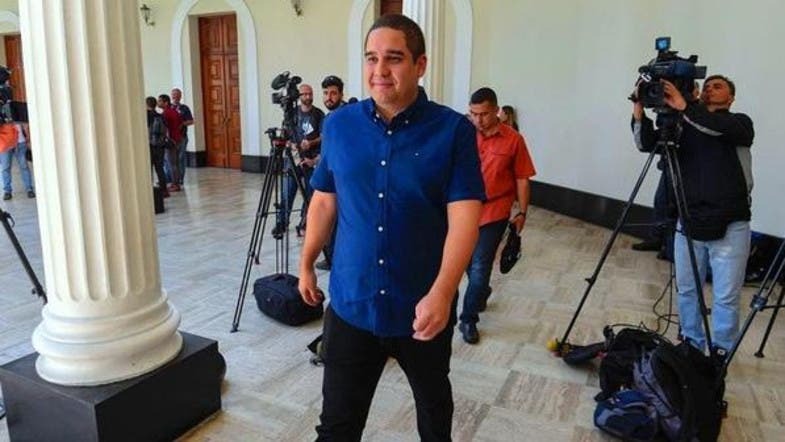 The third word in Nicolás Maduro Guerra, the only son of Venezuelan President Nicolas Maduro, is his mother’s family name, means “war” in Spanish. Guerra launched war on Saturday against US President Donald Trump in a speech, referring to his belief that the White House is in New York, and that it is the capital of the United States. “If Trump dare to carry out his threat of military intervention in Venezuela, the guns would reach New York and occupy the White House,” he said, thinking it was the capital, otherwise he would have said Washington. In response to Trump’s comments on the military option, Nicolas Maduro Guerra, 27, delivered a tough speech in the parliament, it was featured in several videos on Youtube, Al-Arabiya chose the shortest one, in which the Venezuelan president’s son urges Venezuelans to resist the American intervention if it took place, and go to New York to invade the White House with guns. This inspired son has a known story in Venezuela, it is found within what is always written about him. Two years ago, during the marriage ceremony of the Syrian businessman Jose Zalt Al-Zaher in a video displayed by Al-Arabiya, the son of the president ascends the hall of the Gran Melia Hotel in Caracas, with the bride and the groom, he danced to Arabic music, while some of the invitees showered them with local currency. A local currency known as the cheap Bolivar, where the dollar worth’s 15,000 of them these days. As for the then 25-year old son of the president; he got his wallet out and started showering them with categories of 50 and 100 USD. In a hungry country known as one of the most countries in need of hard currency, monitors smugglers and promoters in the black market day and night, when the son of the president denied his dancing “amid a shower of dollars that he was throwing “and he considered it as prejudiced rumors, that’s why the video was uploaded on YouTube to expose him by a click.